Greenwich Market is the heart of Greenwich Town Centre and is a veritable haven of peace set away from the four congested roads which surround it. 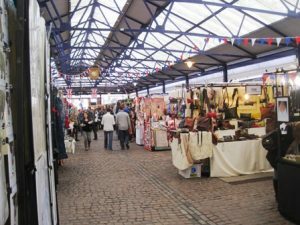 Greenwich Market is predominately a crafts and food market and stalls occupy a square roofed area which is faced on three sides by boutiques many selling high quality products made by local artisans. The fourth side houses the main market entrance providing a wide arched access from College Approach to the north. Each of the remaining three sides of the market has a centrally positioned passageway lined with boutiques and leading to one of the other three roads which enclose the market area. The passages to the south and west lead to the two main shopping streets in Greenwich Town – Nelson Road to the south and Greenwich Church Street to the west. The remaining passage leads east to King William Walk on the other side of which is the main entrance to the Old Royal Naval College. In the south-west corner of the market is the comfortable and atmospheric Coach and Horses public house which serves excellent food at reasonable prices. There has been a market in Greenwich from the 14th century and the current market dates from 1700. Note: A recently decided planning appeal has resulted in the granting of planning permission for the redevelopment of the market to include a hotel on the site. The market is to be temporarily relocated to Monument Gardens while the work takes place. The development is unlikely to commence until 2013. For more information about the appeal and decision click here for the Planning Inspector’s Report. For the amended plans approved by the Planning Inspectorate click here to link to the relevant page at Greenwich Town Planning.